Scientists believe the solar system was formed some 4.6 billion years ago when a cloud of gas and dust collapsed under gravity, possibly triggered by a cataclysmic explosion from a nearby massive star or supernova. As this cloud collapsed, it formed a spinning disk with the sun in the center. Piece by piece, scientists have been working on establishing the formation of the solar system with clues from space. Now, new research has enabled scientists Meenakshi Wadhwa and Daniel Dunlap at Arizona State University’s Center for Meteorite Studies in the School of Earth and Space Exploration, as well as researchers from the University of New Mexico and NASA’s Johnson Space Center to add another piece to that puzzle, with the discovery of the oldest-ever dated igneous meteorite. 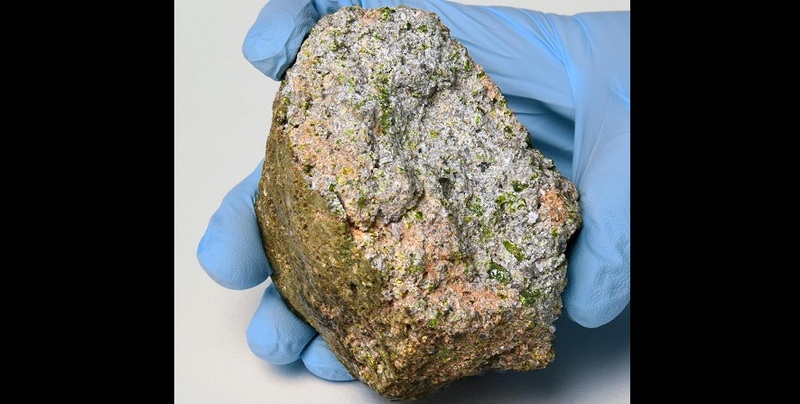 The research on this meteorite, published today in Nature Communications, provides direct evidence that chemically evolved, silica-rich crustal rocks were forming on planetesimals within the first 10 million years prior to the assembly of the terrestrial planets and helps scientists further understand the complexities of planet formation. The research began at the University of New Mexico (UNM) with a yet-to-be studied meteorite, called “Northwest Africa (NWA) 11119,” that was found in a sand dune in Mauritania. The rock is lighter in color than most meteorites and is laced with green crystals, cavities and quench melt, a type of rock texture that suggests rapid cooling and is often found in volcanic rocks which cool rapidly or “quench” when brought to the surface quickly. Using an electron microprobe and a computed tomography (CT) scan at UNM and NASA’s Johnson Space Center facilities, lead author Poorna Srinivasan started to examine the composition and mineralogy of the rock. Srinivasan noted the intricacies of NWA 11119 including its unusual light-green fusion crust. At ASU’s Center for Meteorite Studies, scientists and co-authors Dunlap and Wadhwa used inductively coupled plasma mass spectrometry in their Isotope Cosmochemistry and Geochronology Laboratory, which helped determine the precise formation age of the meteorite. The research confirmed that NWA 11119 is the oldest-ever igneous meteorite recorded at 4.565 billion years old. In addition, the research involved trying to figure out through chemical and isotopic analyses what body the meteorite could be from. Utilizing oxygen isotopes done in collaboration with co-author Karen Ziegler of UNM’s Center for Stable Isotope lab, the team was able to determine that it was definitely extraterrestrial. One possibility is that this parent body was disrupted through a collision with another asteroid or planetesimal and some of its ejected fragments eventually reached the Earth’s orbit, falling through the atmosphere and ending up as meteorites on the ground — in the case of NWA 11119, falling in Mauritania at a yet unknown time in the past. “The oxygen isotopes of NWA11119, NWA 7235, and Almahata Sitta are all identical, but this rock — NWA 11119 — stands out as something completely different from any of the over 40,000 meteorites that have been found on Earth,” Srinivasan said. Most meteorites are formed through the collision of asteroids orbiting the sun in a region called the asteroid belt. Asteroids are the remains from the formation of the solar system, some 4.6 billion years ago. The chemical composition ranges of ancient igneous meteorites, or achondrites, are key to understanding the diversity and geochemical evolution of planetary building blocks. Achondrite meteorites record the first episodes of volcanism and crust formation, the majority of which are basaltic in composition. The next steps for the ASU team are to detail the chronology of this meteorite (and related meteorites) with new isotopic measurements. These new data will help even more precisely determine the age of this unique meteorite and the implications for the evolution of rocky bodies in the early solar system.